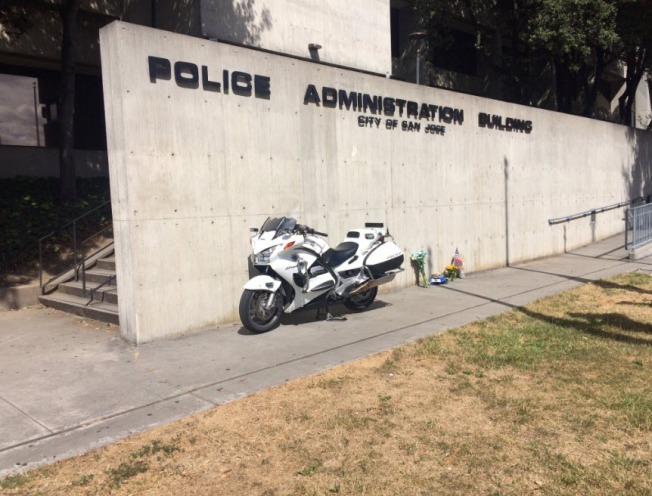 In an outpouring of support for a fallen San Jose police officer, grieving colleagues left a motorcycle in front of the San Jose Police Department on Wednesday, a day after one of their own was killed in a collision with a minivan. Flowers also marked the spot at police headquarters in a growing memorial for Officer Michael Katherman, 34, an 11-year-veteran of the force who died Tuesday after an accident that occurred in the area of 10th and Horning streets. Officers held a procession from the morgue at Valley Medical Center, where his body lay, to a San Jose funeral home. Katherman was riding a motorcycle when he was killed. San Jose police put a motorcycle in front of department headquarters as a tribute to slain Officer Michaell Katherman, who was killed in a minivan accident on June 14, 2016. Katherman was remembered by friends as a devoted husband and father of two young sons who was involved in his church and coached youth baseball and basketball. He also loved his motorcycle, often taking his wife and kids dirt-biking in the Hollister hills. "He was riding his motorcycle back and forth to work every day," said Scott Ban, a neighbor in Gilroy. "Then they'd go dirt-bike riding, and I know eventually he got to ride for the San Jose police. I know that was one thing he really wanted to do." San Jose police Chief Eddie Garcia choked up while talking about Katherman just hours after the accident Tuesday night. "It's tragic," Garcia said. "He put his uniform on this morning and left to go to work and wanted to see his family when he got home. He didn't make it." Garcia said a preliminary investigation showed that Katherman was riding northbound on 10th Street when the male driver of a silver-colored minivan driving southbound on 10th Street attempted to make a left turn onto eastbound Horning Street, and the two vehicles collided. Witness Dan Sullivan and another man came to Katherman's aid immediately after the crash and used the officer's radio to call for help. When officers and paramedics arrived minutes later, they continued life-saving efforts, Garcia said. Katherman was transported to a hospital, where he later died. Sullivan was still visibly shaken up Wednesday night. "When you see something this tragic, a fallen officer, and all they do for the community for all of us, it's really tough to take," Sullivan said. Garcia said Katherman "loved doing his job" and "loved his family." Katherman leaves behind two children, the chief said. The last San Jose officer to die in the line of duty was Michael Johnson in March 2015. Johnson was shot to death while on a welfare check. Johnson's widow Nikki said Katherman helped her with her loss, and now she's grieving for this loss. "I was just heartbroken over hearing about it," Nikki Johnson said. "I know SJPD has lost a brother. Another brother." Last year, Katherman rode in the Police Unity Tour in Washington, D.C., for fallen officers, including Michael Johnson. Tour President Troy Young mourned the loss and reflected on the irony. "Next May, we'll be riding to the memorial again, and his name will be on that wall," Young said of Katherman. Area police chiefs and sheriff's were on hand Wednesday helping SJPD plan the memorial service, as was the group Concern For Police Survivors. "Just to let them know that they're not alone," group President Susan Moody said, referring to Katherman's family. "That we're not only here for them today, tomorrow, and the days after the funeral, but for life." The San Jose Police Officers Association set up a donation site for the Katherman family. Checks can be made payable to SJPOACF and mailed to 1151 N. Fourth St., San Jose, CA 95112, or by clicking here. Today we lost a brother officer. Our thoughts and prayers go out to Michael's family and friends. Rest in peace Officer Katherman. Our condolences to the SJPD family on the tragic loss of Officer Michael Katherman. May God bless and watch over his family.